The 2 elderly couples have left. I’m alone at this end of the kelong. I’m fine with that. 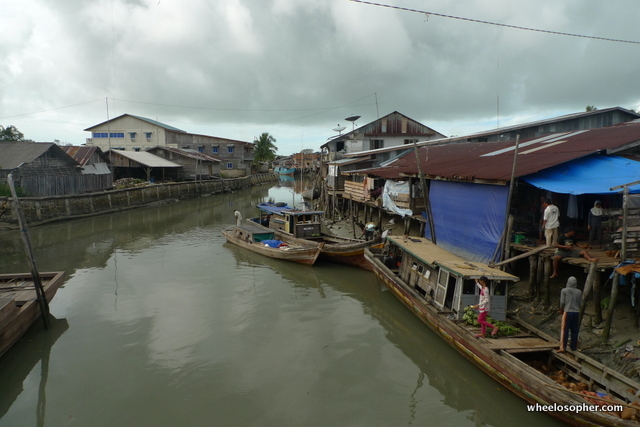 While they were here, I could feel every step as they walk past in front of my room, and I could also hear very clearly every time one of them visited the toilet, flushing their discharges from bowels and bladders into the sea below. 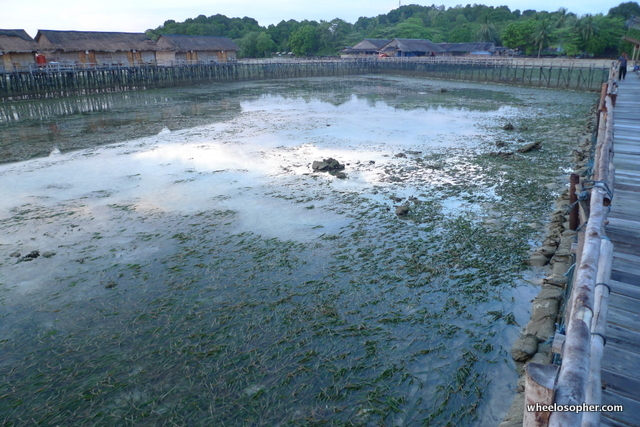 It is not a very nice picture that comes to mind… and this is not a very earth-friendly resort. It’s a rare, laggard’s day out for me. Nothing to do but sit on the porch, read a book, drink some beer, breathe in the salty air. No shirt. No shoes. No cares. Just a pair of shorts. After the included-with-the-room-breakfast of noodles and coffee, I decide to ride to the smallish town that I rode past yesterday on the way to Ocean Bay. I bring along one empty pannier for whatever shopping I may be doing. 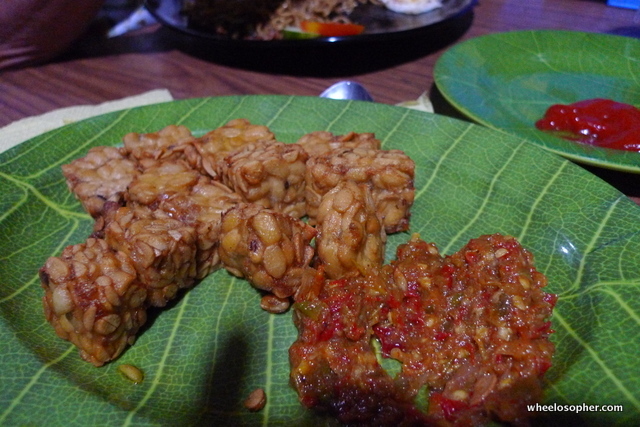 The food here is nowhere near ‘resort’ category, and nowhere near as tasty as what a local Nasi Padang stall would have to offer. 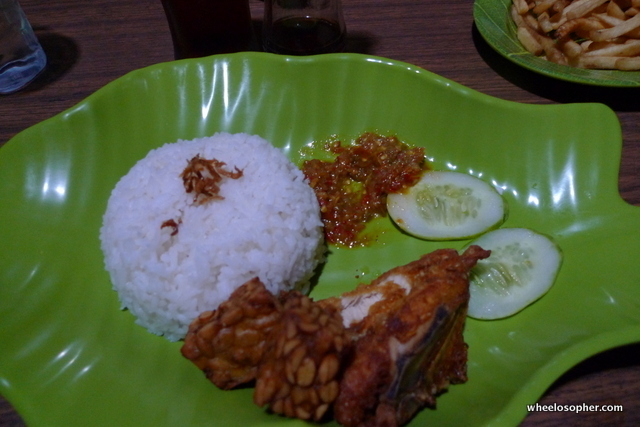 One can never go wrong with Nasi Padang in Indonesia; it’s inexpensive and usually very agreeable in taste, if you’re a Malaysian like me used to spicy food, that is. 7kms out and 7kms back. I’m comfortably stocked with supplies for the rest of the day. Back to just shorts, and legs-up on the porch. The day passes by without me realising it…. Wednesday. My fourth day on tour, and the day I ride to the port town of Tg Pinang to meet with Alvin and gang. 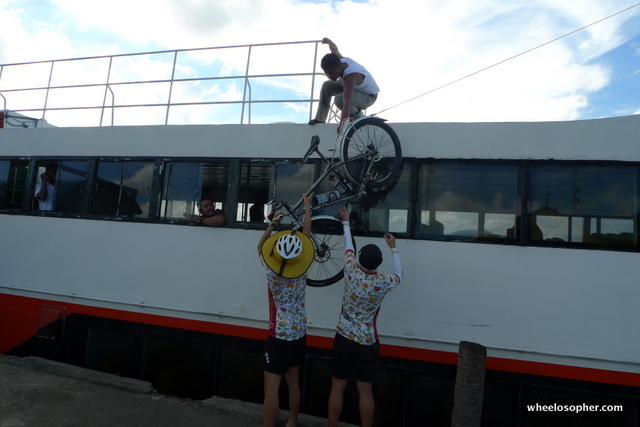 It’ll be an easy 35km-ride but I don’t like taking chances when I have to catch a boat that leaves on time. Today’s itinerary: Trikora – Tg Pinang – Singkep Island – Lingga Island. No one is the group has been to Lingga before. 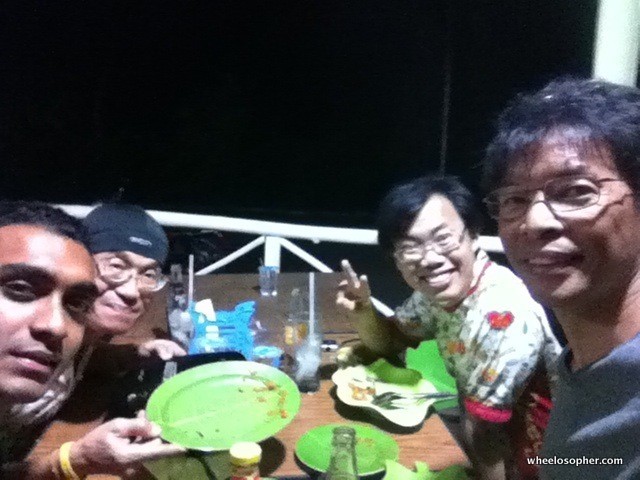 We’d already decided that we’d visit remote Lingga first and then backtrack to Singkep, which Alvin had been to before, the following day. I leave early at about 7.30am. 38Kms exactly later, I arrive at Tg Pinang ferry port. Alvin and friends are nowhere in sight so I circle around a bit, hoping to see them loafing around somewhere. They’re not to be found so I ride back to jetty that the Singapore ferry would have docked at and asked the guard if he had seen any cyclists disembark. He says no, he’s not seen any cyclists but then again, the ferry has just docked so they should be coming out soon. He’s right. At the end of the jetty, I see 3 guys pushing their bicycles towards me. The ever-smiling Pastor Alvin (in Crocs as usual) and the indefatigable Uncle KC, both of them in identical bright, colourful jerseys and Da Brims on their helmets, while the 3rd guy is an unfamiliar face, and without a helmet. L-R: Alvin, KC and Ravi. 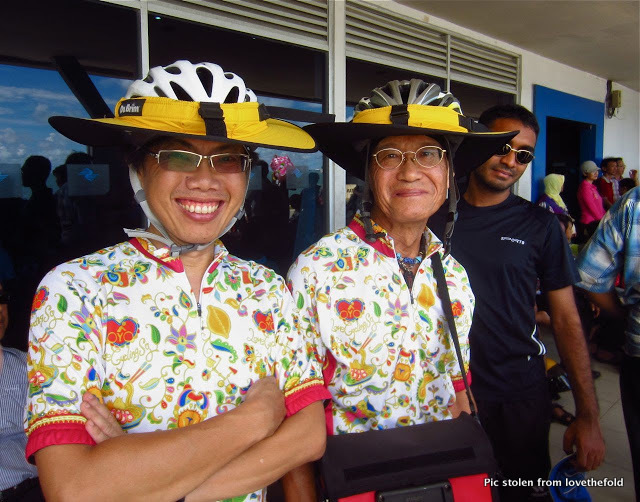 Al and KC are proudly flying the latest colours of LCSG (Love Cycling Singapore), a popular cycling fraternity. 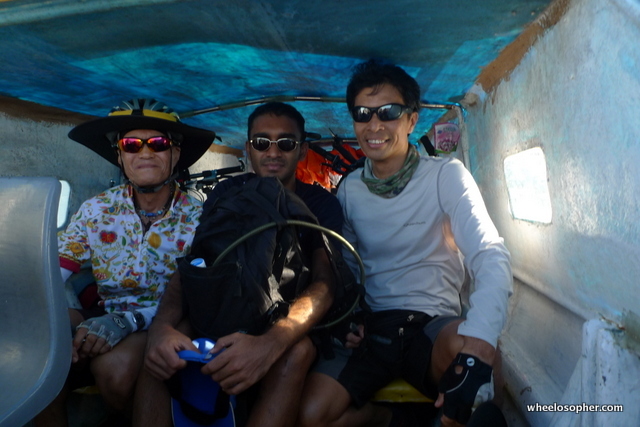 Ravi, the 3rd guy, is a newbie cyclist and tourer, both vocations of which he is endeavouring to add to his list of life’s achievements at one go, and on a borrowed (one of Al’s) bike at that. Brave man. He must also be good with numbers because Al has made him our purser, in charge of the kitty pooled from the 4 of us. The boat leaves on time (not before we have a quick catch-up over lunch). It’s a big boat, air-conditioned, and with the usual karaoke-singalong on TV for entertainment. We dig in for the 3-hr ride to Singkep. 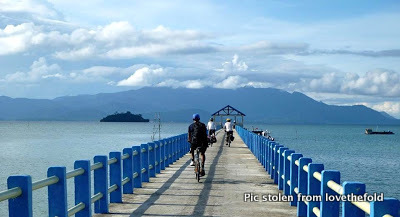 At Jago, Singkep’s main port, we disembark with our bicycles and then make enquiries for a boat to Lingga. 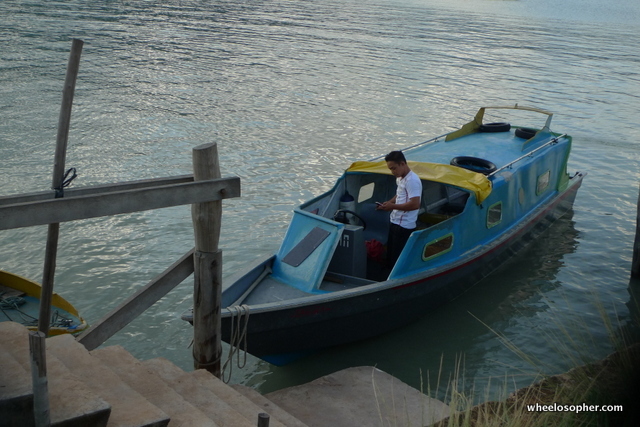 The regular boat to Lingga, oddly enough, leaves at 2.30pm, half an hour before the Tg Pinang-Singkep ferry arrives. We quickly find one but just as quickly we decide that the steep asking price is not quite worth it. So Dabo it is for today instead. It’s a 24km ride along the coast to Dabo. A few kms out of Jago, we stop at a village store to rehydrate. Al spies a long jetty on the other side of the road towards the beach. It’s begging to be explored and Al obliges. The rest of us dutifully follow. The day is still early and 24 kms is not even a warmup for these cycling legends from Singapore, so a little dawdling isn’t going to hurt. At the end of the jetty we meet some locals engaged in one of the island’s favourite pastime – doing nothing. 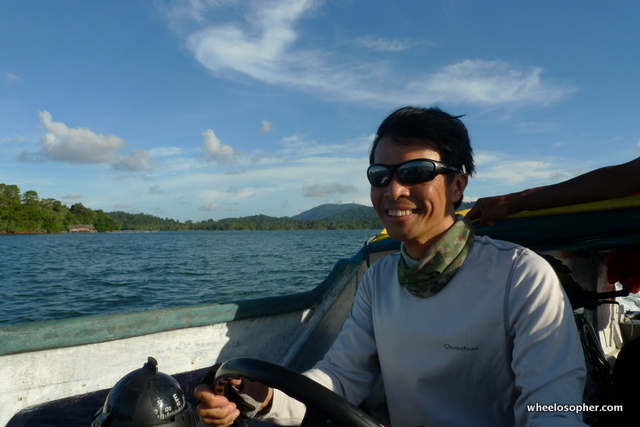 Al, who still hasn’t given up hope of visiting Lingga today, casually asks if we could charter a boat out to Lingga. One the loafers immediately volunteers to get the boat owner. 5 minutes later, boat owner arrives and animated haggling ensues. Al is somewhat challenged in the haggling-in-bahasa-indonesia routine so I’m the designated haggler instead. 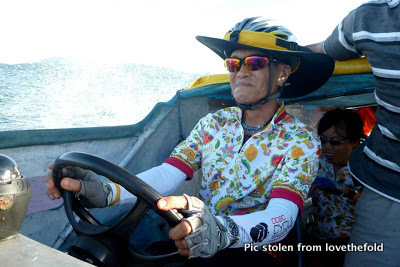 The young boat owner is no match for me and I win hands down – 700,000 Rupiahs for the return journey. That’s 300,000 less than the other guy at Jago. Pleased that our itinerary is back on track, we quickly load our bikes and panniers into the boat and, with a full jerry can on fuel on board, we’re skimming the waves towards Lingga in the evening sun. Little boys. That’s what we turn into once we’re on the boat. I ask the boat-guy to let me drive and he said sure. It’s a straightforward route so there’s no risk of doing a Titanic, he must be thinking. The guys are not about to let me have all the fun so I give them the wheel as well. Grinning silly from ear to ear while spray from the waves pounded by the bow of the boat flew up and onto their faces would just about describe them as one after another, they take their turn at the wheel…..actually, make that all of us. We’re really getting our money’s worth here, we are. 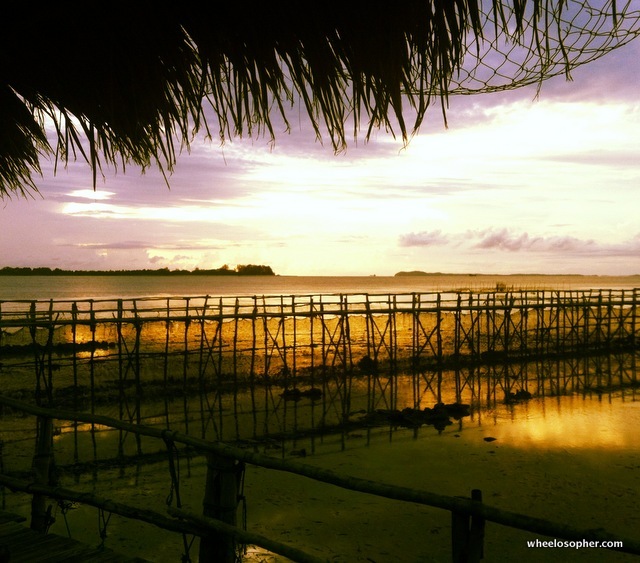 The jetty at Lingga is quiet with little activity, and islanders. After getting his mobile number, and agreeing to meet us here at the jetty tomorrow afternoon, Purser Ravi pays him, half of the agreed fee, of course … just in case. 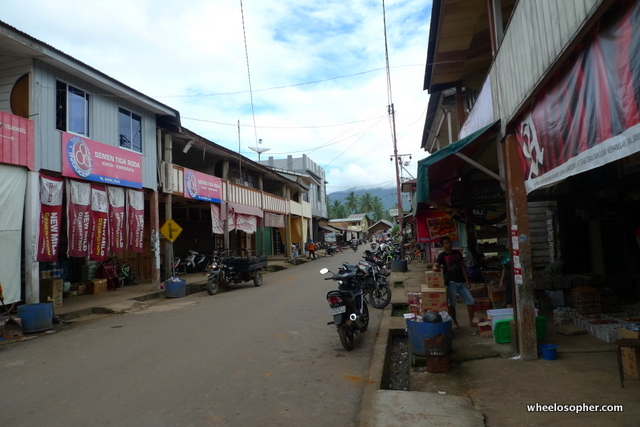 Daik, the main town of Lingga (actually the only town), is about 5kms away. 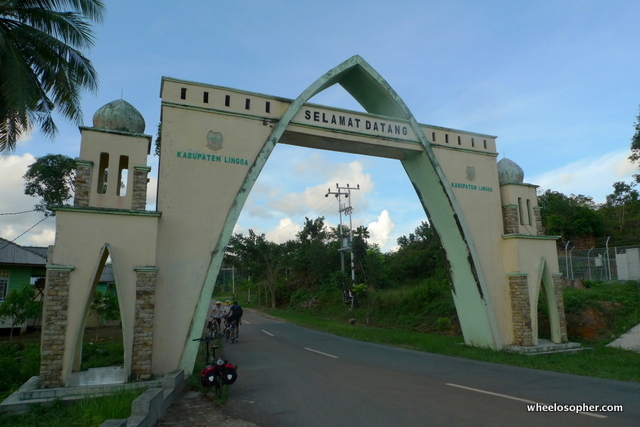 As we pass under a welcoming arch, we’re greeted by a surprisingly well-paved road. As we head towards town, islanders zip pass us on motorcycles; some of whom are young girls who smile at us like it’s the most normal thing to do to strangers on bicycles. Actually, it is the normal thing for them to do, we city slickers are just not used to such island-style friendliness. Better get used to it. It is the beginning of Ramadhan, the fasting month for Muslims, and we arrive in town just before the sounding of mahgrib for iftar, or breaking of fast. Food stalls are brisk with townsfolk out and about buying food for the day’s big meal. Daik is very laid-back. And clean. And very serene. 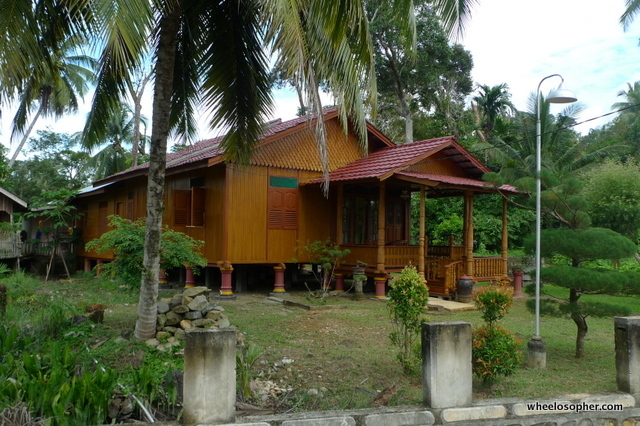 Coconut trees dot the open spaces and in the compounds of some of the prettiest kampong houses I’ve ever seen. 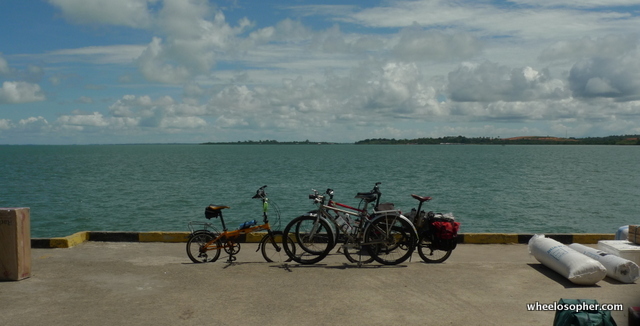 We wonder if we’re the first cycle-tourers to visit this island. A small river runs through the town, probably connecting to an estuary off the coast. 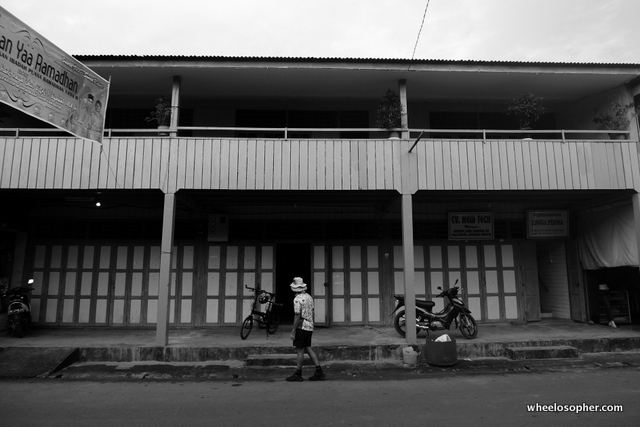 We ride across the small bridge to the other side of the river and locate a recommended hotel. Sun Ling Hotel. It doesn’t pass muster with Al so we decide to explore another one, back where we came from. Hotel Persona. Nicer name than Sun Ling but, will it hold up to scrutiny? The facade looks like it’s pre-war. I’m skeptical but we climb the staircase at the side to check it out anyway. 2 young boys are lounging in the reception. Al, being the pastor that he is, immediately feels vindicated when he sees a TV evangelist expounding The Word. One of the boys leads us into the bowels of the ancient-looking hotel to inspect the rooms. Surprise and surprise …. the hotel extends at least 100 metres from front to back. There are 3 layers to this hotel. #1 is the original hotel rooms. #2 is another newer section and #3 is the latest block, still connected to #1 and #2. A full-fledged lobby with a driveway is at the very end of it. Not quite completed yet but will soon be. The rooms here are swanky. There’s even a suite with a 40″ LCD tv. Brand spanking new. We’re very impressed. We settle for #2. 160,000R a room. Small but very clean. We’re happy. It’s time for our own iftar. 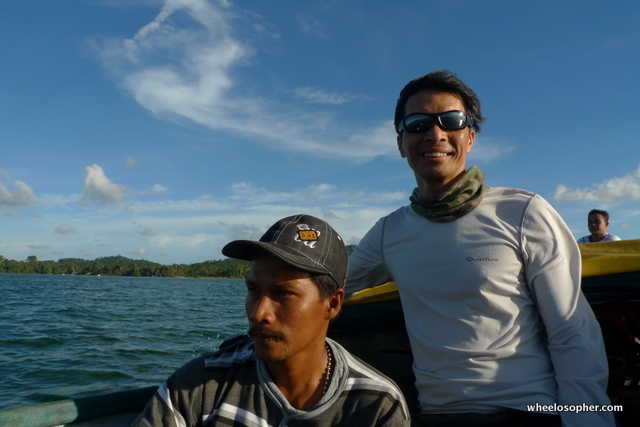 We ask one of the boys where we can enjoy a meal of seafood and he promptly offers to lead us there on his motorbike. It turns out to be a fabulous meal. Today has been a good day. Tomorrow, we explore the other end of the island, and a waterfall. M Khor. I had one of my worst night at ocean bay. The water pump seemed operating all the way into the early morning. Like you had said….it echoed all the way into my dreams…maybe nightmare! Should have recorded the sounds and blogged it … nightmare on demand haha!